Another week wrapped! And my training reboot continues to go well. I got in all of my runs and the training reboot is chugging along. This is the third week in a row that I logged over 20 miles for the week. I'm not sure how long it's been since I've managed that, but I think it's been a good long while. I'm actually starting to think about things like a real race schedule, goal races, and even possibly (maybe) running my second full marathon in early 2019 depending on how this training ramp up goes. But of course, it can't always be smooth sailing - last week I had a nasty breakout of poison ivy (thanks, dogs, for rolling in it in our backyard) and had to go to the allergist twice. Fortunately, even though I had it everywhere, I was able to avoid using prednisone and got it under control with a few days of topical creams. Yay for small favors. 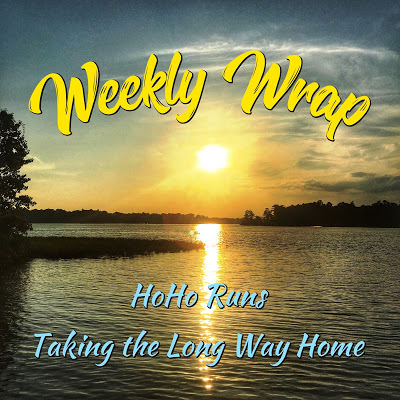 Keep reading for details of my week, and you can always follow along on Instagram at my joint account with my race-cation friend, Jenn (@solesistersjourney), my running hashtag #saltwashedrunner, or my Into the Glimmer Instagram account (@intotheglimmer) - you'll find more than just running there. Intentional rest day. I don't even really remember what else I did on Monday other than work. And itch from my poison ivy. Probably not much. Like the week before, I missed my Tuesday run, but I did get F45 for a strength workout, so the day wasn't a total wash. This time I missed my run because of that pesky poison ivy - not that it kept me from running (it didn't), but I had to go to the allergist and that sucked away time that I would have used to run. I headed out for an easy 5-miler on Wednesday. It's exciting to see my regular runs increase in distance. It's been awhile since that's happened! Another 5-miler completed. I was supposed to do speedwork on Thursday, but I'm having a heck of a time getting motivated for that right now. I'm just happy to be back out running at all, so I'm not going to beat myself up over missing speedwork after just getting back into a solid schedule after years of issues. It was almost 80 degrees on Friday when I headed out for my run, and I wasn't even scheduled to run that day. But, I just wanted to get out and remember what warmth felt like. This run was about nothing more than relaxing and zoning out under the sun. I kept a relaxing (slower than easy) pace and just enjoyed the miles. Friday was also the perfect evening to head to the beach, drink some fruity frozen drinks, and kick off the weekend. Since I ran on Friday and I knew I had 8 miles on the schedule for Sunday, I decided to give my legs a break. In the morning, we went to a local farmer's market and visited the Angel Oak. Then, in the afternoon, we went on a short family hike at some local trails instead. I ran 8 miles on Sunday, which was my longest run since October. And it was a hot one! 76 degrees and 96% humidity, but there was a lovely sea breeze (and by that, I mean there were 10 mph headwinds, as usual). It's nice to be complaining about heat instead of cold, though. And we ended our weekend the same way we started it: at the beach. And that was my week. I have some work travel coming up that's going to knock my schedule off a bit, but I'm hoping to still get most of my miles in over the next few weeks. In any case, I'm feeling much more confident that I'll actually be able to have some decent races come fall. How was your week? What are you training for right now?